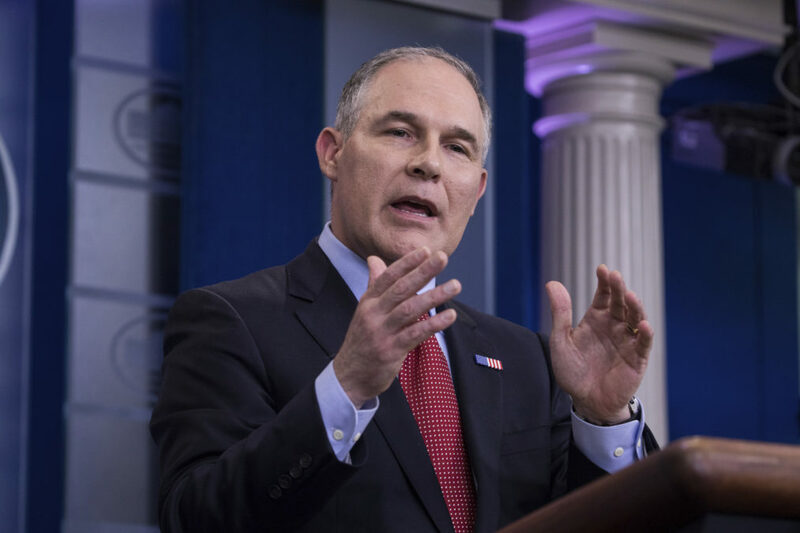 Environmental Protection Agency Administrator Scott Pruitt says experts who serve on the EPA’s scientific advisory boards can’t provide objective advice if they receive agency grants. 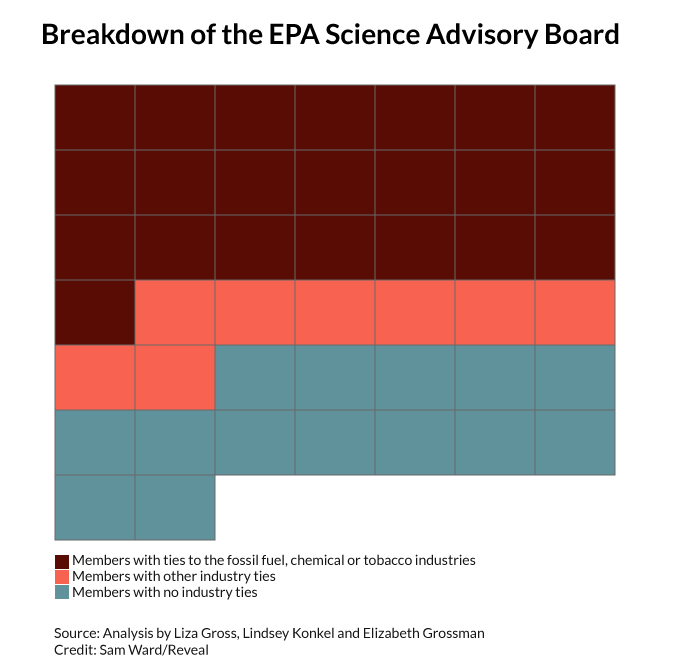 Eleven new members of the Environmental Protection Agency’s Science Advisory Board have a history of downplaying the health risks of secondhand smoke, air pollution and other hazards, including two who have spun science for tobacco companies, according to an investigation by Reveal from The Center for Investigative Reporting. Earlier this month, EPA Administrator Scott Pruitt fired all board members who currently receive EPA grants for their research, saying they cannot remain objective if they accept agency money. In replacing them, Pruitt transformed the board from a panel of the nation’s top environmental experts to one dominated by industry-funded scientists and state government officials who have fought federal regulations. Pruitt removed 21 members of the advisory board, mostly academics, and replaced them with 16 experts with ties to industries regulated by the agency and two with no industry ties. Fourteen of the new members consult or work for the fossil fuel or chemical industries, which gave Pruitt nearly $320,000 for his campaigns in Oklahoma as a state senator and attorney general. Under the Obama administration, industry-affiliated scientists made up 40 percent of the Science Advisory Board, or 19 of its 47 members. Under President Donald Trump, 68 percent of the board, 30 of its 44 current members, now has ties to industries. That leaves 14 with no industry ties, including two Obama appointees who work for environmental groups. The Science Advisory Board, established by Congress in 1978, helps the EPA ensure it has the best available science when crafting regulations and standards that address the nation’s drinking water, air pollution, toxic contamination and other environmental problems that threaten public health. “If memberships are weighted toward viewpoints that support the agenda of the administration, then the administration is signaling that it’s not asking for advice, but for a rubber stamp,” said environmental scientist Deborah Swackhamer, who was chairwoman of the board under Presidents George W. Bush and Barack Obama. Keeping drinking water safe. Shielding vulnerable populations from air pollutants that trigger asthma and heart attacks. Protecting communities from cancer-causing chemicals. These are the EPA’s mandates. And when making key decisions about science to follow these mandates, the agency relies on panels of advisers. The Science Advisory Board is arguably the most important panel among 22 federal advisory committees that report to the EPA. The board gives the agency advice on specific matters, such as the impacts of fracking on drinking water supplies, factors that drive algae blooms in the Great Lakes and whether the agency’s risk assessments are scientifically sound. The board doesn’t give guidance on proposed regulations. Rather, it vets the scientific foundations on which those recommendations are built, such as how dangerous the air pollutant ozone is at certain exposures or at what dose an industrial chemical would raise the risk of cancer. To get the best science to policymakers, the EPA long has relied on a diversity of experts and a tradition of keeping politics out of scientific deliberations. In establishing the Science Advisory Board, Congress called for experts from academia, industry, nongovernmental organizations and federal, state and tribal governments. Most board seats over the past several decades have been held by government-funded university researchers. But in February, Lamar Smith, chairman of the House Committee on Science, Space and Technology, convened a hearing called “Making EPA Great Again” to investigate what he called the EPA’s “political agenda.” Smith, a Texas Republican who disputes climate science, said Science Advisory Board experts under Obama had “become nothing more than rubber stamps who approve all of the EPA’s regulations” because they receive millions of dollars in government grants. Last month, Pruitt said experts who serve on the EPA’s scientific advisory boards can’t provide objective advice if they receive agency grants. He promised an audience at The Heritage Foundation, an anti-regulatory think tank that questions climate change, that he was “going to fix that” by restoring the “independence and transparency and objectivity in regard to the scientific advice we are getting at the agency” by prohibiting scientific advisers from taking EPA grants. Pruitt has required advisory board members to remain “financially independent” of the EPA, but has placed no such restrictions on scientists with ties to industry. A Reveal investigation shows that several new board members have a history of criticizing mainstream science to cast doubt on the health risks of commercial and industrial air pollutants and products. One new appointee, Kimberly White, is a senior director at the American Chemistry Council, a trade group that represents chemical manufacturers, including Dow Chemical Co., Exxon Mobil Corp. and DuPont Co. The group for decades has fought EPA regulations on widely used chemicals linked to health effects, including flame retardants, formaldehyde, asbestos and plasticizers. The new appointees also include scientists who have served as expert witnesses for industries regulated by the EPA. Dr. Samuel Cohen, a cancer expert at the University of Nebraska, testified on DuPont’s behalf in a lawsuit holding the company liable for illnesses related to drinking water contaminated with perfluorooctanoic acid, or PFOA, a chemical DuPont used in a West Virginia plant that made Teflon. Cohen testified that the plaintiff’s kidney cancer was caused by her obesity, not PFOA, yet an independent science panel has found a probable link between the chemical and serious health conditions, including kidney cancer. Two of Pruitt’s new appointees helped companies defend their products or fight restrictions on secondhand smoke, and another sought more than $300,000 in tobacco industry funding but was rejected. Graham got his $25,000 and later served as an adviser to The Advancement for Sound Science Coalition, a group created by Philip Morris to discredit an EPA report that identified secondhand smoke as a carcinogen. Graham told Reveal in an email that he received larger amounts of funding from the EPA and Centers for Disease Control and Prevention to run his Harvard center. He also said he worked to reduce particulate pollution while head of the Office of Information and Regulatory Affairs under President George W. Bush. But Graham instituted an approach to risk analysis, according to a report by the Union of Concerned Scientists, that challenged the scientific consensus underlying regulations on ozone, fine particulate matter and formaldehyde pollution. The EPA decided not to tighten its health standard for fine particulate matter in 2006 under Graham, rejecting the recommendations of its expert panel for the first time on ambient air pollution. Another new board member, Louis Anthony Cox, early in his career worked for consulting firm Arthur D. Little, which contributed to the industry’s discredited effort to develop a “safer” cigarette. He later testified on behalf of Philip Morris and three other tobacco giants against a smoker’s husband who sued the companies for lying about the dangers of cigarettes. Cox received at least $22,000 for his services from tobacco industry law firm Shook, Hardy & Bacon – the same firm that helped Philip Morris create “sound science” guidelines to challenge the EPA’s listing of secondhand smoke as a carcinogen and in 2016 sued the EPA on behalf of the coal industry to prevent the agency from enforcing carbon emission reductions under its recently repealed Clean Power Plan. In addition to his membership on the Science Advisory Board, Cox has been tapped as chairman of a separate EPA board, the Clean Air Scientific Advisory Committee. In addition to his work on behalf of the tobacco industry, Cox also has questioned the benefits of reducing particulate pollution in a paper sponsored by the American Petroleum Institute. The center was disbanded in 1998 after the tobacco companies agreed to stop sponsoring research as part of a landmark settlement of a federal lawsuit that charged the industry with conspiring to hide the dangers of smoking for decades. In an email to Reveal, Phalen said he did not recall seeking any grants from the tobacco-funded group. He told the American Association for the Advancement of Science in 2012, “Modern air is a little too clean for optimum health.” Children’s lungs, he was quoted as saying, need to be exposed to irritants to learn how to ward them off. But studies repeatedly have shown that children are highly susceptible to air pollution for a variety of reasons, including because they breathe more air per pound of weight, have immature immune systems and spend more time exerting themselves outdoors. Another new board member, Stanley Young – a statistician who advises The Heartland Institute, an anti-regulatory think tank that showcases global warming deniers at its annual conference – recently has questioned evidence underlying EPA regulations on air pollutants. Young also is an adviser to the American Council on Science and Health, which describes itself as a “pro-science consumer advocacy organization” but is funded by free-market foundations and the chemical, fossil fuel and tobacco industries and challenges evidence supporting regulations. Young did not respond to a request for comment. Research from around the world has reported a link between air pollutants and deaths and hospitalizations from respiratory disease and heart attacks. Young published a critique of this evidence in Regulatory Toxicology and Pharmacology, a journal known for publishing industry-friendly science. The new board members’ dismissal of well-established science about air pollutants worries former board member and Princeton University air pollution expert Denise Mauzerall, who was removed by Pruitt. “I fear the protection of our environment is in grave danger,” she said. Peter Thorne, chairman of the Science Advisory Board before Pruitt’s purge, cited the panel’s guidance to the EPA about strengthening standards for ozone and fine particulates as an example of how science protects public health. Thorne is an occupational and environmental health expert at the University of Iowa College of Public Health who also was removed from the board. The EPA has funded some of his research. Earlier this month, 10 senators – nine Democrats and an Independent – asked the head of the Government Accountability Office to review the EPA’s move to purge the board of agency-funded scientists, noting that it appears to strengthen the voice of industry-funded scientists. Former board chairwoman Deborah Swackhamer said Pruitt’s upending of the board signals the EPA’s shift away from using scientific evidence to guide policy. “There has always been a very strong culture of trying to make sure this committee remains objective in its role,” said Swackhamer, professor emerita at the University of Minnesota’s School of Public Health and Humphrey School of Public Affairs. She voiced particular concern about the appointment of Michael Honeycutt as the newest chairman. Honeycutt, director of the toxicology division of the Texas Commission on Environmental Quality, rejected evidence that the EPA’s proposal to tighten the ozone standard will yield health benefits. “What’s happening, unfortunately, is many polluters’ interest groups are taking a page out of the tobacco playbook, casting doubt on the science to delay decision-making,” Burke said. This story was edited by Marla Cone and Amy Pyle and copy edited by Nadia Wynter and Nikki Frick. Reporter Elizabeth Grossman died from ovarian cancer in July. Liza Gross can be reached at lizagross@gmail.com, and Lindsey Konkel can be reached at lrkonkel@gmail.com. Follow them on Twitter: @lizabio and @LindseyKonkel.